Easter, the Holiest day of the Christian Faith is this Sunday, April 1st and memories of childhood Easters have been washing over me this week. For most of my adult life, I hosted my family’s Easter dinner but those occasions are not what I am remembering. No, I am going way back, back to the 1950’s and 60’s, my growing up years. And I smile……………………………. 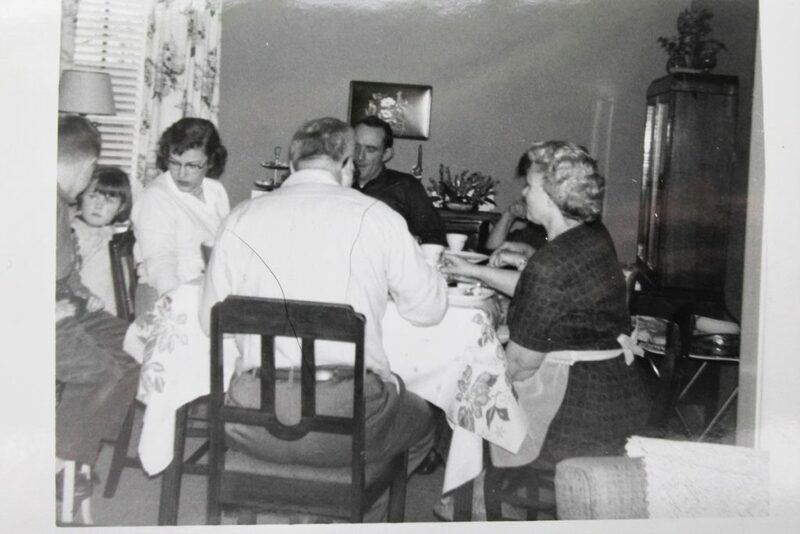 My Mom’s brother, my much loved Uncle Dinny and his lovely wife, Aunt Ruthie held Easter dinner at their home on Brigham Rd., in Dunkirk, NY. Easter dinner was there every single year until I was in my 20’s. Funny, I can even remember their house number and phone number but I can’t remember what I had for breakfast today. If I close my eyes I remember what their house smelled liked. It was the aroma of clean and of wonderful, delicious food cooking. I can hear my Uncle’s voice, clear as a bell even though he went to God in April of 1981. I can see Aunt Ruthie’s beautiful smile and hear her once again say ” Oh Walter,” my Uncle’s real name. 1960: That’s Uncle Dinny with his back to us. Aunt Ruthie is on his right. My handsome Dad is opposite my Uncle and that’s my pretty Mom to his left. Easter Sunday started every year with us kids looking for our Easter Baskets and the hidden colored Easter Eggs that we dyed the day before. I always found eggs under the sofa cushions! Oh how exciting those Easter Egg hunts were to 4 little kids! Every year my mother made her girls a new Easter dress. How she found the time I’ll never know. Mom had 4 children, her elderly parents lived with us and she worked as a Nurse as well as tended the farm. A labor of love for sure. Mom had an Easter corsage and so did we girls. Just a simple Carnation but it sure made us feel special. A plastic bag up high in a closet held an assortment of Easter Bonnets and each year we’d go through them picking out our favorite. Bathed, hair curled, teeth brushed, new dresses on, we’d sneak some jelly beans into our pockets before we headed off to Sunday School and Church Service at the First Baptist Church in Dunkirk, New York. 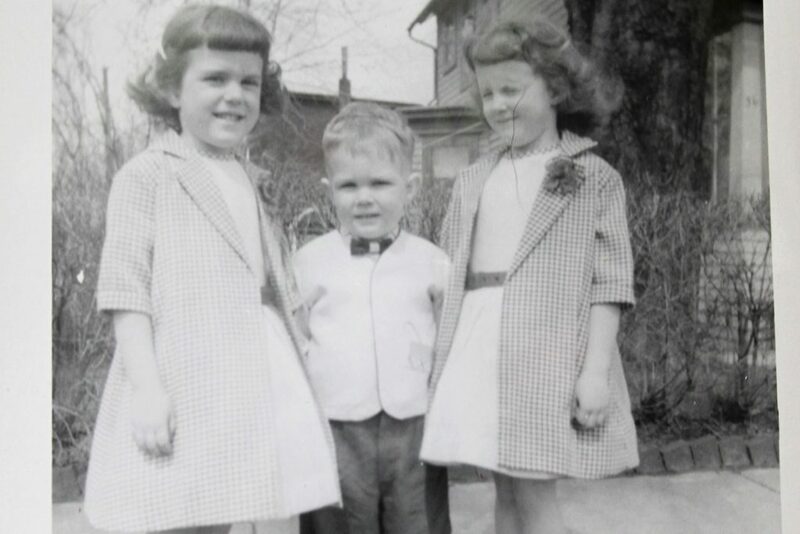 Easter was one of those rare days when my Dad would don a suit and tie to accompany his Bride and Brood to Church. That’s me on the left in 1957. I was 4 years old. We still lived in Dunkirk. I vividly remember those dresses. White sleeveless shifts with red sashes and black and white checkered jackets. I loved that dress! My sister and I were just 1 year apart in age and the tendency to dress us alike was strong! My brother was adorable with his little bow tie. After squirming our way through Church, (why was service always so long on Easter?) we loaded ourselves in the station wagon to go home and change our clothes. Mom gathered up her homemade pies that she made for dinner and we again, loaded up the car to go to Uncle Dinny and Aunt Ruthie’s. The dinner menu never changed, nor did we want it too! A fabulous Morrell EZ cut ham roasted to perfection. While my Uncle carved the ham, I would sneak into the kitchen where he’d slyly slip me a morsel. I loved that man! The Ham was served with Aunt Ruthie’s special Raisin Sauce. A sauce that to this day I serve with every Ham I bake. Mashed Potatoes, Peas, a Relish Tray and Hot Rolls rounded out the menu. Oh wait….. I forgot the Jello Pear Salad. That’s because every year Aunt Ruthie made this Jello Salad and every year she forgot to get it out of the refrigerator! Oh…..these sweet memories! Dinner ended with Mom’s famous Apple and Pecan Pies. She was the best pie baker. After dinner, we cleared the table and the ladies washed up all the dishes while the men relaxed in the living room and we kids ran outside to play. If it wasn’t raining or snowing, we went one block over to the playground at #5 School and happily teeter tottered, swang on the swings and slid down the slide. Then it was time to go home. A bunch of tired, stuffed kids with equally tired stuffed parents. Home to our living room and the newspaper and the television and maybe a little nap on the floor. And that was Easter for the Castleberry/Burchett family every single year. I would not have changed it for the world. 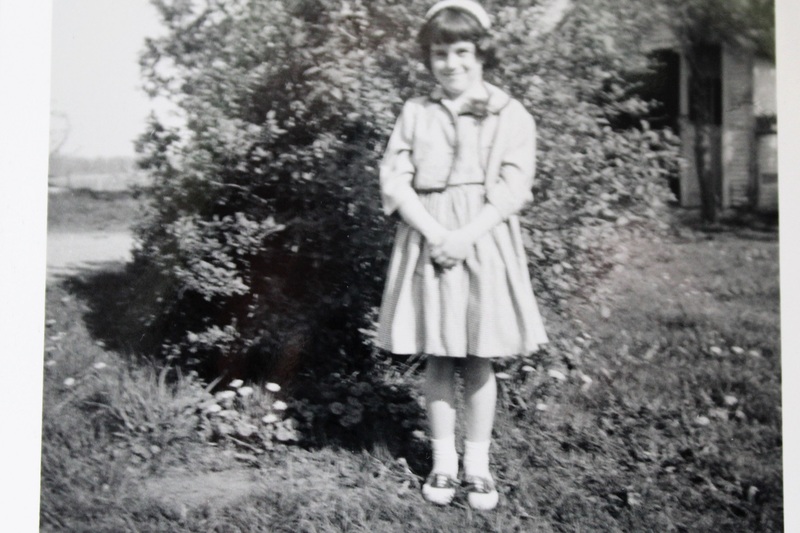 Me, in my Easter finest as an 10 year old in 1961. Excuse me while I go get a Kleenx. Memories are leaking out of my eyes and rolling down my cheeks. Have a Blessed Easter my friends! And please, make some memories that will last a lifetime.